The only way to reach the Mt. Kilimanjaro summit is with your own two feet. Even though shoes may not necessarily be the first thing on your packing list, starting with the right hiking boots is essential for climbing Kilimanjaro. Bring the wrong boots and you’ll risk getting sidelined by blisters and lost toenails — or worse, a sprained ankle or a back injury that prevents you from reaching the peak. To increase your chances of making it to the top, let’s talk about the best boots to bring on your Kilimanjaro trek — and how to know when you spot them. Should you take your trusty trail runners or invest in a serious pair of hiking boots for your mountaineering? Head over to your local outdoor or hiking store to get your feet measured by an expert. They’ll know which manufacturers make boots specific for your foot’s needs. Don’t have a mountaineering store in your neighborhood? If you order hiking boots online, remember that determining the fit can be a bit trickier. 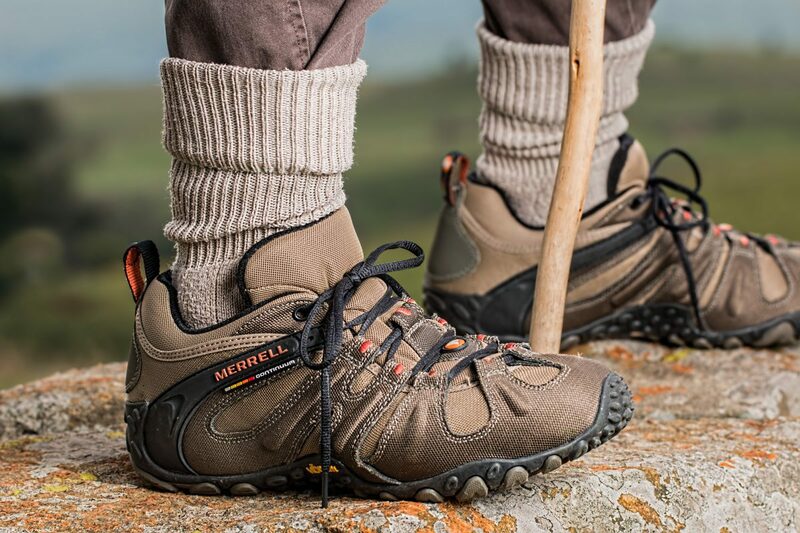 However, a general rule of thumb is to choose hiking boots a half to one size larger than your normal shoe. Your feet will swell on your Kilimanjaro hike so you’ll need to give yourself extra room for that — and room for thick socks and a liner too. So, if you normally wear a size 9, you’ll want to browse boots in sizes 9.5 and 10 for the best fit. How will you know proper fit? Use the index finger test. Slide your foot all the way forward in your boot so your toes touch the front. Then, stick your index finger between your heel and the end of your boot. If you can easily fit your finger in the gap, the boots may be too big. A loose-fitting boot will cause your feet to slide around and create friction, which leads to blisters (and possible infections). If you can’t fit your index finger back there, or you’re fighting serious resistance, the boots may be too small. Tight boots won’t allow your feet the room they need to expand during your hike and they’ll start to hurt. A perfect fitting boot will not wobble, slip, squeeze, pinch, or poke your feet in any direction. Since the Kilimanjaro trails are so diverse, you’ll want a hiking boot to provide proper stabilization no matter what terrain you’re trekking upon. Hiking boots will give your ankles the support they need when they’re at strenuous angles climbing up and down all day. Without this, you risk spraining or twisting your ankle. Full-height or medium-height boots provide more support than those with lower profiles. The sides of your boots should go above your ankle at a minimum. Higher sides also protect the insides of your boots from taking on rain, snow, and mud. Pay attention to the types of laces on your hiking boots as well. The lacing system should take advantage of D-hooks and strong strings that not only give you a snug fit but faster lacing and better support. The trail terrain gets much rockier and icier the closer you get to the Kilimanjaro summit. To help you maneuver through this terrain, the soles of your hiking boots should have plenty of deep lugs (or grips). These will give you extra traction and a firm grasp of the trail as you hike slippery terrain and trails with rocks, ice and wet debris. Thick, rubber soles will keep you from injuring and bruising the bottom of your feet when you’re hiking on rocks, pebbles, sticks, and other objects on the trail. However, having deep grips also means that your boots are heavier, too. Weight does matter – as we’ll discuss next – so you want to find the right balance between the right grips and the right weight. A few ounces of extra weight may not sound like much – or even feel like a big difference when you first slip into your boots – but wait until you get out on the trail. When you’re not used to hiking in a heavy boot, the walk alone can be quite tiring, let alone climbing one of the tallest mountains in the world. That’s why we recommend medium weight boots; you’ll have the best of comfort and safety. Since you’ll be hiking through five different climate zones on the way to the Kilimanjaro summit — from wet rainforests to snowy glaciers at the peak — you’ll always want to prepare for dampness from rain, morning fog, and snow. And that means your hiking boots must be waterproof. When the moisture inside your boot has nowhere to escape, it will get trapped and make your feet clammy and susceptible to blisters. Many waterproof materials aren’t breathable, and that’s a big deal breaker when you’re climbing Kilimanjaro. Most hiking boots say they’re waterproof, but it’s a good idea to find waterproofing material that’s trusted in extreme climates, like Gore-Tex. This isn’t only lightweight and windproof, but it’s also been tested with awesome results. Now that you know all the most important characteristics to look for in a Kili hiking boot, check out a few of our recommendations for the best ones. So now that you have a few boots on your Kilimanjaro packing list to try on, let’s go over 5 more expert tips for making the climb in your new boots as comfortable as possible. 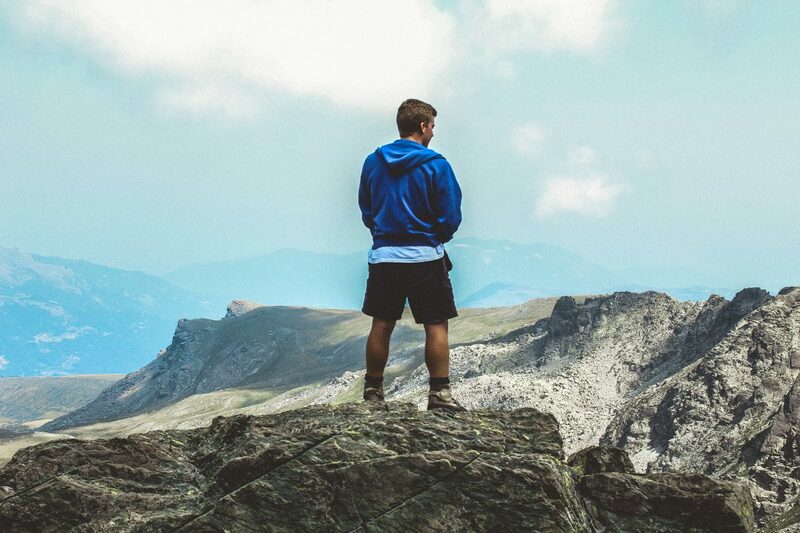 Sure, you may have purposely purchased your new hiking boots solely for climbing Kilimanjaro, but you don’t want that adventure to be the first time wearing your new boots. Like most shoes, hiking boots need to broken in before they’re super comfortable for your feet. That means you’ll need to wear them a decent amount of time before relying on them for your Kili climb. To break in hiking boots, try to wear them as often as physically possible — especially during your Kilimanjaro hike training. Walk at least 2 or 3 long-distance hikes (think: 4–6 hours long) in your new boots before bringing them on your Kilimanjaro trek. How will you know when you’ve broken in your new boots to the point of packing them? Look for the inner soles of your boot to slowly mold and form to the contours of your foot. Your worn-in boots should feel not only like they were made for you, but made for hours (upon hours) of trail walking. If your boots never get comfortable, experiment with different lacing techniques or consider another pair. It’s better to know this information sooner when you can change things versus on your hike when you’re stuck. You can’t throw on any ol’ pair of socks for a Kilimanjaro hike. The right fit and the right material make all the difference. Socks with flat seams are better than those with bulky ones, which will increase friction in your new boots and lead to blisters. Snug, thick socks will provide more cushion for the bottom of your feet making it easier to walk comfortably for extended periods. Loose socks will create extra material in your boot (see above point) and may cause discomfort; tight socks will be even worse as your feet swell. Stay away from cotton and cotton-blend socks as cotton will not wick away moisture and instead absorb all your sweat. You’ll be hiking for 6+ hours a day through hot, humid climates and damp feet are prone to blisters. Wool wicks away moisture to keep your feet dry, warm, and comfortable. Merino wool can actually help regulate your body temperature and it even has antibacterial properties. Some hikers like to wear liner socks made of polypropylene underneath their hiking socks to keep their feet extra dry and warm. Just make sure to find liners that maintain their shape so they don’t add bulk to your boots (try the Bridgedale Coolmax liner sock). Warm thermal socks, which are super thick and heavy, will keep your toes from turning blue and prevent hypothermia as you approach the top of the mountain. A gaiter is a waterproof sleeve you attach to your boot that covers your calves and lower legs. It keeps trail debris like water, small rocks, and mud out of your boots. These come in handy when it’s raining on your Kilimanjaro trek and protect your boots and hiking pants from getting too wet and dirty. You’ll be wearing your new hiking boots on the trail, but you’ll want to take them off ASAP once you reach your camp. 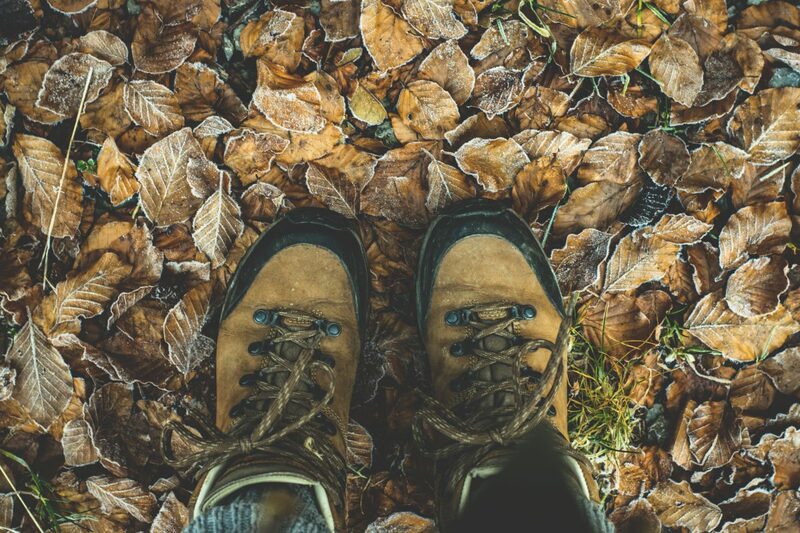 While your hiking boots air out for the following day of trekking, you’ll want to mosey around the camp in a pair of lightweight shoes, trail runners, or grippy sneakers that have soles made for exploring trail terrain. You’re going to be wearing your new hiking boots all day for almost two weeks straight, climbing mostly uphill and downhill, and very rarely on smooth, flat terrain. If there was ever a time to invest in quality and durability, it’s for your Kilimanjaro climb. Follow our tips today and let our 40+ years of experience climbing Kilimanjaro give you the confidence you need to reach the summit. And remember, just like you’ll never regret investing in a high-quality pair of hiking boots, you’ll never regret taking your trip with one of our trusted Tusker guides. Learn more about what makes a Tusker Trails adventure unlike any other and get the lowdown on everything about your future Kilimanjaro trek.